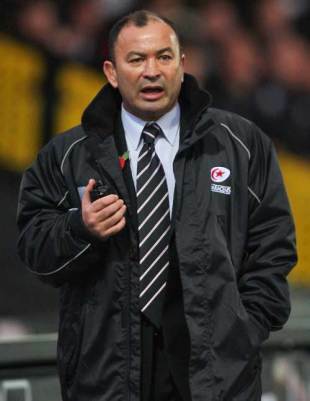 Former Australia coach Eddie Jones has thrown his hat into the ring for the vacant England manager job. Johnson decided to stand down after presiding over England's disappointing Rugby World Cup campaign, which ended with a quarter-final defeat to France. Jones insisted the rewards of getting England back on track were "enormous" with the 2015 World Cup being played on home soil. He told BBC Radio Five Live: "You'd always be interested in coaching England. It has got a fantastic domestic competition, very, very good players and you have just got to get the right programme in place and they should be good enough to win the next World Cup." Jones led the Wallabies to the 2003 World Cup final, where they were beaten by the England team captained by Johnson, and helped coach South Africa to victory four years later. Jones said he would not be put off by the chaotic state of the Rugby Football Union's senior management. "Over the last period of time England rugby has lost its way and you'd have to question the people in place now," Jones said. "That is the challenge of getting it right. If you get it right, the benefits are absolutely enormous. That is the challenge of it and that is the exciting part of it. "You've got to find the right style of play, just as [Sir Clive] Woodward did over that period (up to 2003), work with the clubs and ensure the players are in peak condition." However, Nick Mallett revealed he was approached by the RFU this week about the prospect of taking charge of England, should Johnson resign. But the former South Africa and Italy coach confirmed in a statement on Wednesday evening he had decided against taking the RFU up on their offer in order to spend more time with his family. "The RFU contacted me earlier this week to enquire about my availability for the position, should Martin Johnson resign," Mallett said. "I had previously expressed my interest in the position publicly and was interested to hear what RFU representatives had to say. "After mulling it over for a few days and discussing the opportunity with close friends and family, I have decided that I will not be making myself available for the position and I have disclosed this to the RFU." England's elite rugby director Rob Andrew must act swiftly, with the RBS 6 Nations looming in February. New Zealand's World Cup-winning coach Graham Henry has been mentioned as one possible option, while Northampton boss Jim Mallinder is seen as the leading domestic contender.